Bloomberg is a pretty big company. It’s founder, and current New York City Mayor, is Michael Bloomberg and the company itself has multiple units from Professional Services to News & Media.Those Media assets include Bloomberg TV and bloomberg.com. Telling the difference between the two is sometimes pretty difficult which is why sports leagues should take notice. 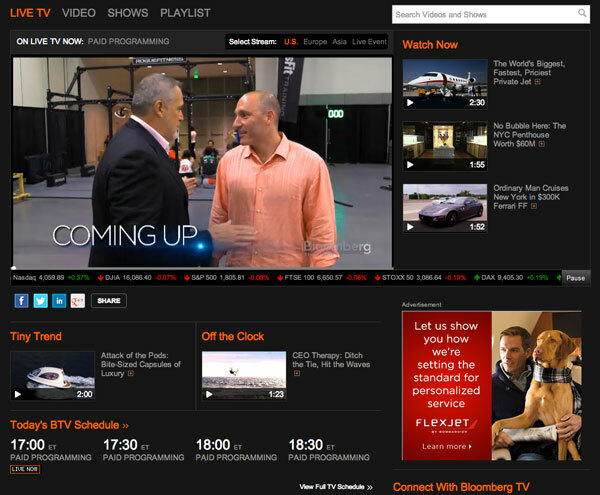 Bloomberg.com streams live TV and has on demand original shows like C-Suite. Other networks do this too, sort of. The difference, with Bloomberg is you don’t need any kind of TV subscription. It’s just out there and free for anyone to watch. That’s right, free for everyone. Not an add on or free with your subscription. Just free. To watch ESPN3 or use their WATCH ESPN App you need to sign in and prove you have a cable or satellite subscription. Even then you may not get complete access to all the live games (ask DIRECTV users about that). Bloomberg on the other hand is the complete opposite. They give total access to everyone regardless of cable or satellite subscription status. The NFL, NHL, NBA and MLB all have their own TV networks yet not one has free, live streaming. They all have highlights from their broadcasts but none offer 24 hour live streaming of their studio shows much less their games. In a word, money. They feel they can make money doing it the same old way they’ve been doing it. They also probably fear that if they did something similar to Bloomberg then they’ll upset the cable or satellite operators. As a man once said, ‘fear is tissue paper disguised as a brick wall.’ Make no mistake cable and satellite providers need content and the more live content the better. Sports is pretty DVR proof which means that people need to sit through ads. Why sports leagues continue to do it the same old way is beyond modern thinking. To be fair, Bloomberg makes most of their money through their professional services division where they sell financial software tools, analysis and an actual Bloomberg terminal. So they are diversified within the financial world. However, this should mean that they would protect certain assets vs. opening them up to everyone. According to the old game plan that the sports leagues and ESPN are following is, ‘protect the TV and continue to charge the cable and satellite providers more per customer.’ But Bloomberg goes the new route. Open up as many revenue streams as possible by going where your customers are. Yet here we are. In a world where a financial services/news company live streams their video content 24/7 for no charge and sports leagues and networks don’t or make you verify your paying status. A word to the sports folks, from leagues to networks, follow the Bloomberg model. You’ll be amazed by the fan support, the young demo’s you’ll attract, and the new ad revenue streams. Or continue do they road you’re going and hope for the best. As one of Rumsfeld’s Rules states, “If you’re coasting, you’re going downhill.” (L.W. Pierson).